Osaka Prints wrote of this image: "Hikosan gongen chikai no sukedachi (A vow to serve with a sword at Mt. Hiko Shrine: 彦山権現誓助剣) is an example of an adauchi mono (revenge tale: 仇打ち物). The play first was performed as a ningyô jôruri (puppet play: 人形淨瑠璃) in 1786 (Kabuki premiered in 1790 at the Naka no Shibai, Osaka). 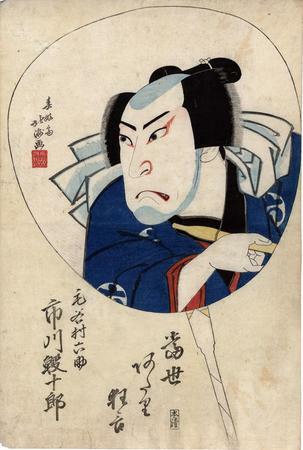 When Yoshioka Ichimisai, a sword instructor to the Kôri (Môri) clan, is killed by Kyôgoku no Takumi, his widow Okô and daughters Osono and Okiku swear revenge. Okiku is killed by Takumi, but her young son Yasamatsu escapes. Around the same time, Keyamura Rokusuke, once a student of Yoshioka Ichimisai, is surviving as a farmer. Even so, he is a samurai known for his filial piety and incredible strength. His swordsmanship is so renowned that the local daimyô (military lord: 大名) proclaims that anyone who can defeat Rokusuke will be hired as a sword instructor. Rokusuke finds Yasamatsu without realizing he is the grandson of his late teacher. He hangs the boy's kimono outside his house hoping that his family will see it. Rokusuke is visited first by an elderly woman, and then by a woman disguised as a komusô (traveling priest: 虚無僧). She sees Yasamatsu's kimono and misidentifies Rokusuke as an enemy. He fends off her fierce attack, and then Yasamatsu identifies her as his aunt Osono. She suddenly takes on a feminine demeanor, a transformation in voice and body movement that is a highlight of the play. Then the elderly woman reveals her identify as Yoshioka Ichimisai's widow and mother of Osono. Meanwhile, Takumi has taken on the disguise of a rônin (masterless samurai, lit., "wave man": 浪人) named Mijin Danjô. After Osono identifies Mijin Danjô as Takumi, Rokusuke joins in the effort to avenge his swordmaster's murder. When Rokusuke is refused a match against Danjô because of his humble state as a farmer, he becomes a retainer of the great warrior general Katô Kiyomasa (加藤清正, 1561-1611) after demonstrating his martial skills and is given the name Kida Magobee (貴田孫兵衛). Now a samurai, he challenges Mijin Danjô to a match and defeats him. The play ends with Kiyomasa's departure for the Korean campaign (1592-1598). The phrase atari kyôgen (big-hit play) in a series title appears from time to time in Osaka prints. It served as an announcement of a popular play in current production and as advertising to drum up even bigger audiences for the remaining run of the play." This is from a performance of the play Hikosan Gongen Chikai no Sukedachi (A vow to serve with a sword at Mt. Hiko Shrine : 彦山権現誓劔) at the Kado Theater 1825/3 from the series A Successful Performance of the Present Day (Tōsei Atari Kyogen) There are six other known designs in this fine set of Osaka heads. Illustrated in a small black and white reproduction on page 56 of Ōsaka Kagami 大阪鏡 by Jan van Doesburg.